What does it mean when your groomer tells you your dog is matted? 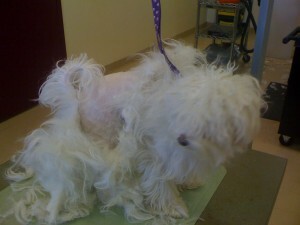 Your dog is matted when you can’t get a comb thru the hair. It is as simple as that. It is just like when you can’t get a comb or brush thru your own hair when you have tangles. 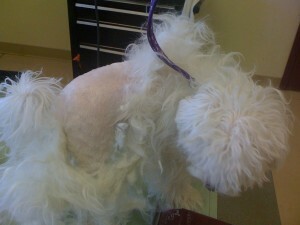 I ask all the time prior to taking an appointment “is she matted” the answer is always “oh no, I brush her.” It’s ok to be honest with your groomer, it doesn’t always mean you are going to pay an arm and a leg to have your pet de-matted, but it does mean you will come up with a solution for humanely getting rid of the mats much faster. Were not here to judge you for how little or how much you brush your dog, If you don’t have the time to keep your pet brushed out, and don’t want to bring them to the groomer every 2 weeks then I would definitely recommend a short cut for your pet. We want your dog to be happy and healthy first and foremost and then of course we want to make them as gorgeous as possible. If mats are a reoccurring issue for you and your pet, ask for a brushing demo at your next appointment. 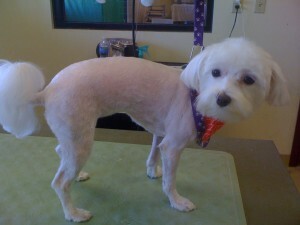 We’d be happy to show you proper techniques for maintaining your pet’s coat, in between regular grooming. This entry was posted on Monday, February 1st, 2010 at 8:03 am	and is filed under Uncategorized. You can follow any responses to this entry through the RSS 2.0 feed. Responses are currently closed, but you can trackback from your own site.